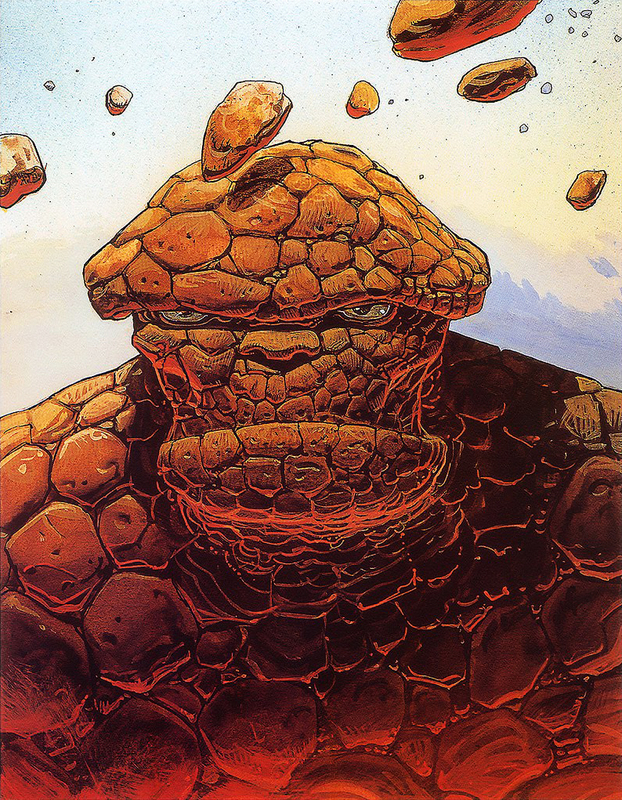 Marvel prints by Moebius (1990) | 'TAIN'T THE MEAT… IT'S THE HUMANITY! I’m in the mood to post some pretty pictures, and they really don’t get any prettier than these. 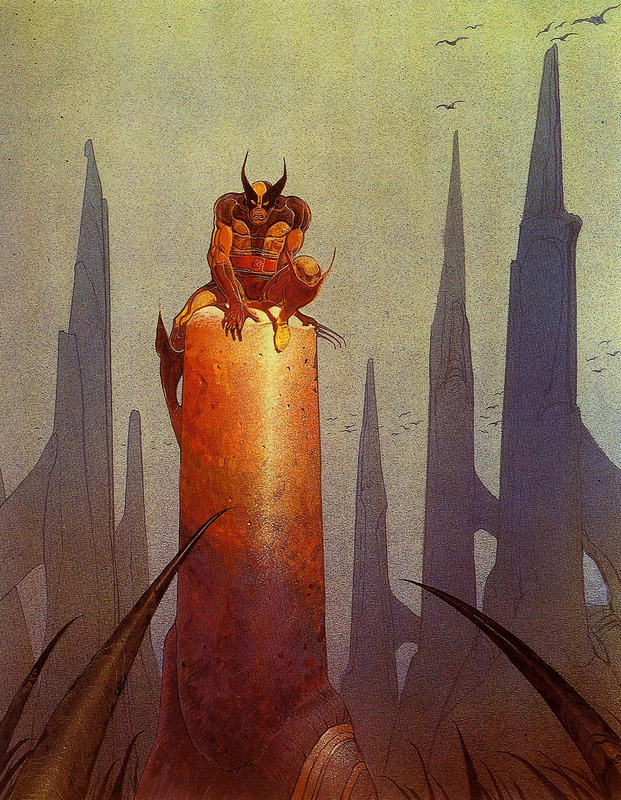 In the late-1980’s French comic book artist Mœbius (the pen-name of Jean Giraud) painted seven images featuring some of Marvel Comics’ most iconic characters: Spider-Man; Iron Man; The Punisher; Daredevil; Elekra; Wolverine and The Thing. 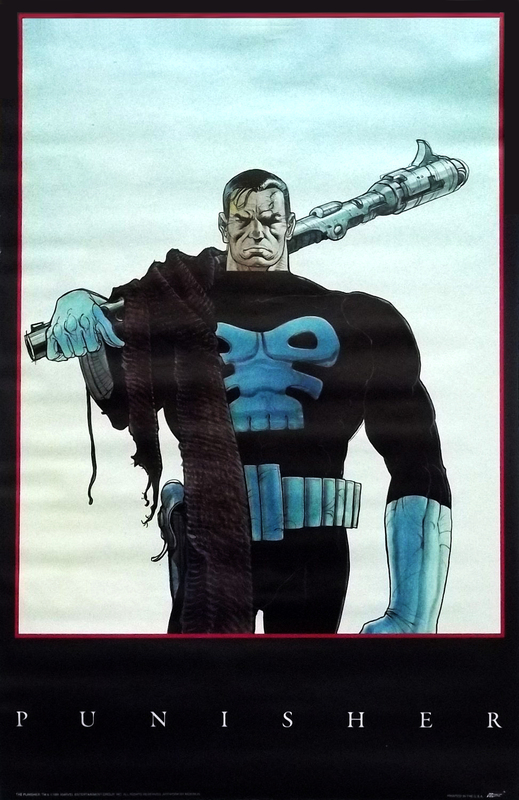 The paintings were released as posters in 1990 and quickly went out of print (they can still be found on ebay but they aren’t cheap). 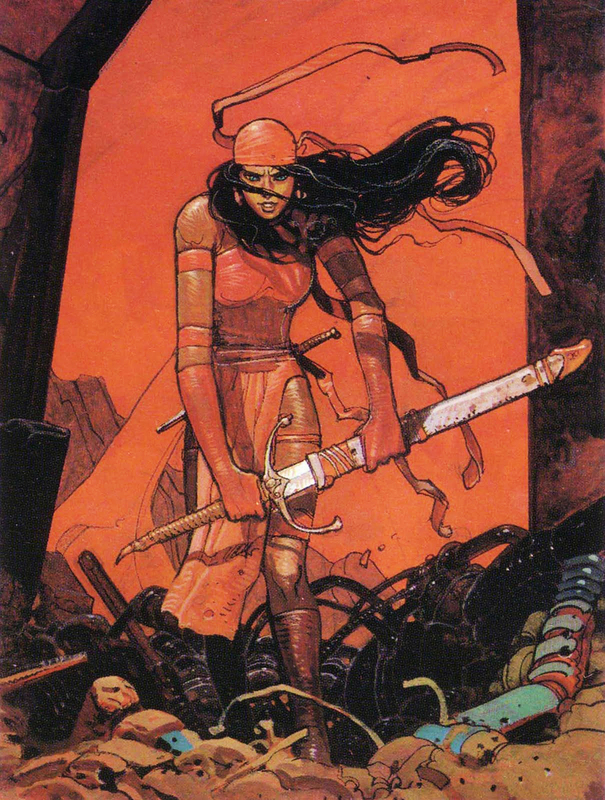 As one of Europe’s premier independent comic book artists Mœbius was perhaps not the obvious choice to work with the corporate Marvel, but the US giant had recently reprinted some of Mœbius’ stories under their Epic imprint. 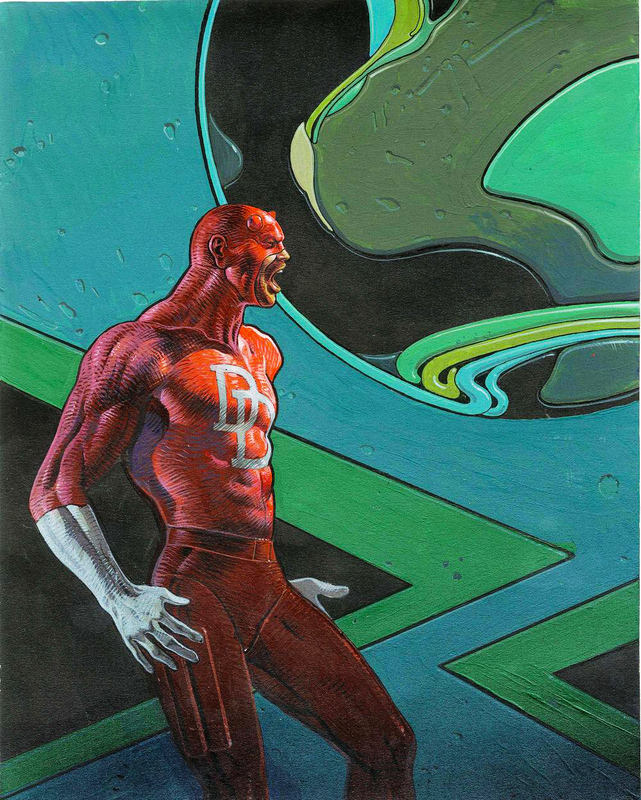 And in 1988 the artist collaborated with Marvel Legend Stan Lee on a two part story: The Silver Surfer – Parable (1988), which went on to win an Eisner award. To even the most casual of comic book fans the name Mœbius will be a familiar one. 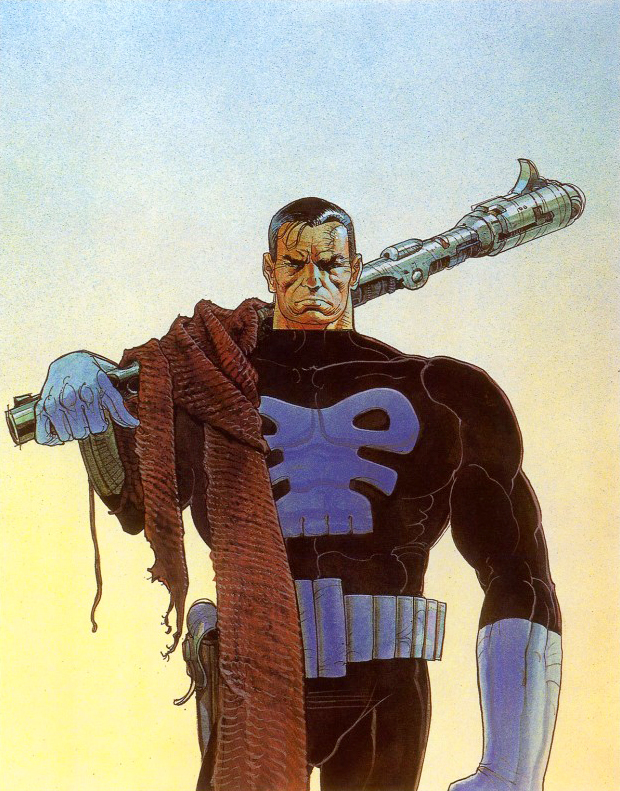 During his long career he worked on numerous graphic novels (his most famous creation, Blueberry, was a collaboration with writer Jean-Michel Charlier), helped found the science-fiction and fantasy magazine Métal hurlant (renamed Heavy Metal in the US) and worked as a storyboard and conceptual artist on numerous film, such as Alien, Tron and The Fifth Element. 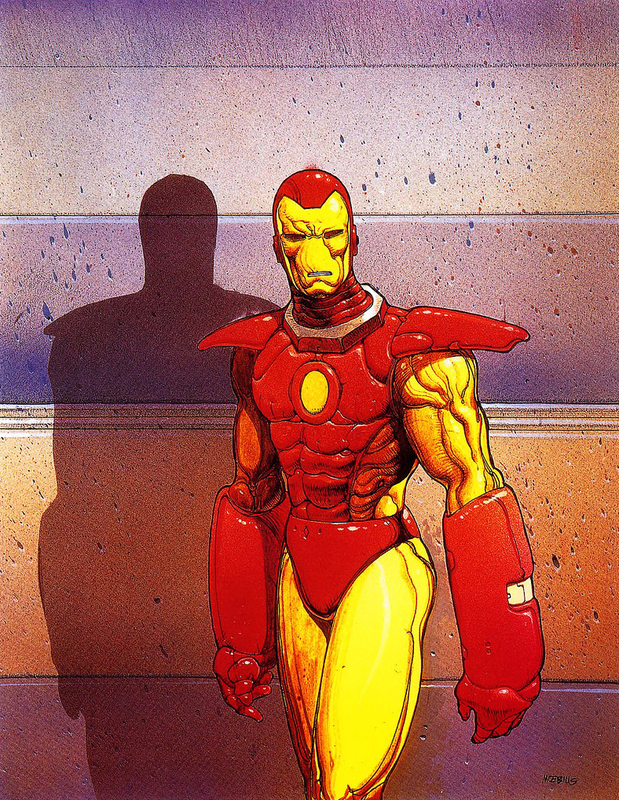 Mœbius’ art style is so visually distinctive that it’s wonderful to see his take on these classic Marvel superheroes. Apparently the artist wasn’t overly familiar with the characters, leading to some interesting interpretations. 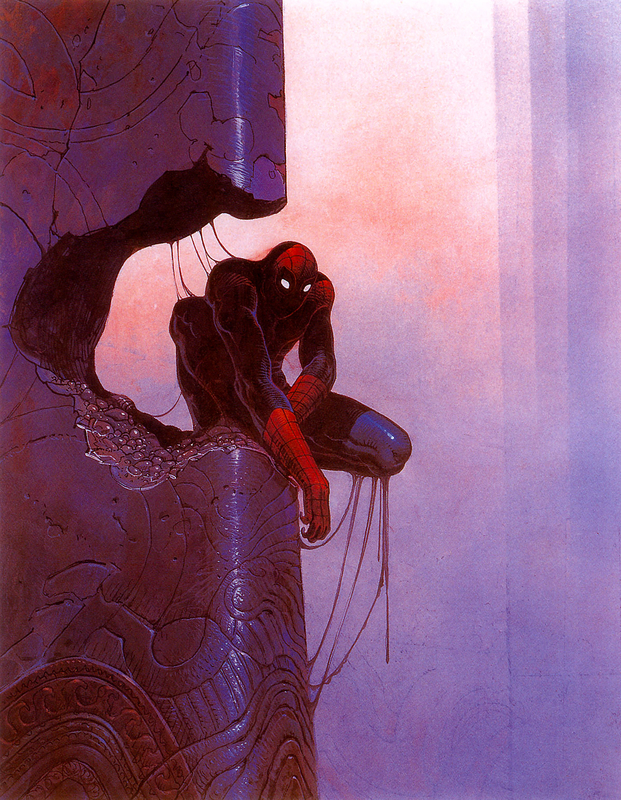 Spider-Man, for instance, looks almost menacing as he squats in the ruins of some alien-looking building. Iron Man‘s mask ripples with undisguised emotion while The Punisher looks as if he’s just stepped out of a Sergio Leone western. My favourite though must be The Thing – I don’t think any other artist has so successfully conveyed the character’s quiet loneliness and dignity. Here are all the Mœbius prints – click for larger versions.